Liquid-Tuff liquid-tight conduit from AFC Cable Systems® can be used in a variety of applications ranging from computer room floors to high temperature areas. 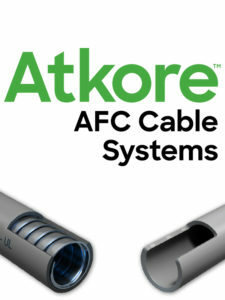 Continuous length reels are available in AFC’s non-metallic liquidtight up to 5,000 feet without seams. Seamless reels provide cost savings by reducing labor time and the purchase of additional fittings to connect lengths. Additional options included liquidtight products that are approved for direct burial, for use in splash zones, zero halogen, oil resistant and more. The Extreme Temperature Liquid-Tuff products have a temperature rating from -60C to as high as 150C.